Keeping your house ready to face the flood is important as you cannot predict the weather. When your house is maintained properly, it will be easier for you to claim a coverage from the insurance company. The following are 6 tips on how to prevent a water damage from occurring in your home. The roof that shelter your house can deteriorate over time after exposure to outdoor weather elements such as rain, hail, and snow. For this reason, you should check the roof at least once or twice a year. You know for sure that the leaks come from the roof when there is missing shingle or the shingle has cracks. Water stain on the ceiling is sign that the leaks from from the roof. You have to find the leaks before damage spread to all the roof. The best way to check the roof for leaks is to go up to your attic with a flash light and check for water stain during a rainy day. Water leaks can happen if the gutter and downspout are blocked. It is important that the gutter and downspout are clear from any rubbish in order for the rain water to flow smoothly. Some of the common debris that end up on the gutter are dead leaves, sticks and acorns. If you hire a professional, they may use powerful air blower to blow the debris away. They may also use a long pole to shove the debris off to the ground. If you are willing to climb the roof, you can use your hand to pick them up and put them in a plastic bag. After that, you can use a water hose to flush the gutter. Water can get in through the window if the seal around it is damaged. You can examine the window up close to see if there is any hole in the seal or any screw missing. The damaged or missing parts of the window can easily be purchased at the local hardware store. If your window has warranty, you should call the warranty hotline number and get it fixed for free. Appliances like washing machine, dishwasher and refrigerator are also common sources of water leaks. You can check the water supply hose that connects to the back of machine for any drop of water. The hose must always be in good shape. If the hose is corroded or rusty, you must replace it. The leaks could also be caused by internal hoses, pump or tub fittings that have worn out. It is hard to detect leaking on a plumbing system as some pipes are hidden behind the wall and under the wall. If your water bill suddenly goes up, it could be that somewhere on the pipe in your house is leaking. It is recommended that you hire a professional to run a complete check on the house structure for any signs of leaking every year. Protecting your home from hurricane disaster is important because it is one of the biggest investment you make in your life. It only takes a single storm to destroy your house so you should do your best to protect it. There are several things that you can do before the hurricane and heavy rain storm approach. The first thing you should do is to take time to review the insurance policy. You must make sure that it has sufficient coverage for covering the cost of rebuilding the house in the event the hurricane damage your home. Most people will just purchase the same coverage as the price when they buy the house but they are ignorant that rebuilding the house will incur more costs. You should survey your inventory and keep a list of all the items. In this way, you will know how many items you have and their values. Having this information will make it easier for you to submit claims and get compensation when the flood damages your items. Flood damage often occur because of a leaky roof so it is important that the roof is secured and not have any hole that allows the wind and rainwater to enter. One way to secure your roof to the wall is to use a hurricane strap to tie it. By tying the roof to the wall, it can prevent it from being blown away by the hurricane wind. Besides, you should inspect the roof shingles to make sure there is no hole that can allow rain water to leak into the house. Climbing up the roof to inspect the shingles can be dangerous so it is recommended that you hire a professional to do the inspection and fix the damaged roofing materials. You can consider re-roofing your house if many of the shingles are cracked or cannot be found. Re-roofing involves sealing the roof with a waterproof tape to prevent the water from coming out. If there is any hole on the wall that connects wires from outside into the house, make sure you get these holes sealed so that the rainwater cannot enter and cause water damage to your home. If there is a tree growing near your house, you should consider trimming off the heavy branches. Doing so can prevent a tree branch from falling onto the roof of your house or your neighbor’s house. It is possible for the strong wind to break the tree branch and fly it at a high speed towards your window. The insurance policy will only cover a small portion of the tree removal fee if there is a tree branch falling accident that hit your house or your neighbor’s house. This entry was posted in Uncategorized on August 27, 2017 by . Hurricane Matthew has killed at least 11 people as it passes through several islands in the Caribbean. Out of the 11 deaths, there are at least 5 deaths that occurred in Haiti. Hurricane Matthew has left a path of destruction and threatening Florida with a widespread damage in the impoverished Haiti peninsula. An important bridge in the Petit Goave town in Haiti has been destroyed so that it is now impossible to travel to the southwest. Many roads are flooded to the point that vehicles cannot pass through. The communication structures have been destroyed preventing the people from communicating through phone. According to Francois Anick Joseph, the Interior Minister of Haiti, the strong hurricane wind has wrecked many houses leaving them in a pile of ruins. There are some houses where the rooftops have been blown away by the strong wind. There are also houses that were completely destroyed by the hurricane. Milriste Nelson, a farmer who own a farm in Leogane town told the reporters that the many of his neighbors evacuate their homes quickly when the strong wind blew away their metal roof. Nelson said all the fruit crops on his fruit trees are all gone because of the hurricane storm. Several hours after the hurricane has passed through Haiti, government leaders of nearby countries claimed that they were unaware that the hurricane could leave such a devastating effect on the country which regularly gets flooded. Hurricane Matthew hit Haiti before as a category 5 storm almost a decade ago. Haiti is the poorest country in the region with most of the people living in the slums. At least 10,000 Haitians have gone to seek refuge at the temporary shelters. Many hospitals are overcrowded with people. The entire country is not facing a shortage of water supply. Mourad Wahba, the representative for the deputy of secretary general said that Hurricane Matthew ranks in the second place as the most devastating humanitarian event following the big earthquake which struck Haiti in January 2010. The weather forecast station tracked Hurricane Matthew to moving southward to Bahamas starting on the early hours of Wednesday. It was moving at a speed of 125 mph at 2 am EDT and its next target will be Bahamas. By early Wednesday, the tropical storm has already caused some damages in the southeastern part of Bahamas. The White House told the press that the USA has sent some relief supplies to help the victims who are facing the aftermath of the hurricane in the southeast area of Haiti where emergency warning has been declared. The hurricane will possibly be arriving in Florida on Thursday and it could leave a heavy impact like what has happened in Haiti. Therefore, Rick Scott, the governor of Florida has talked to the residents about the hurricane. He has persuaded the residents about making adequate preparation and making sure that there is enough food, water and medicine. The streets of Florida is filled with a panic atmosphere and many people have already rush to the supermarket to stock up as much supplies as possible. You should also be stocking up the necessary supplies in case you are not leaving to other regions and plan to stay in Florida. If you have a mortgage on your home and you reside in a flood prone area, then your lender probably requires you to purchase flood insurance. However, if you live in a moderate to low risk zone and your community participates in the National Flood Insurance Program, than you have the option of buying it or not buying it. If you are questioning whether or not you should purchase flood insurance, your first question is probably “How much is this going to cost?” Federal Flood Insurance can cost just a few hundred dollars, or up to $10,000 a year depending on the risks your home poses. Here are some other facts that may help you make up your mind. First off, your homeowners insurance does not cover flood damage. Most homeowner’s policies only cover rain damage. Once this water touches the ground and enters your home, it is a flood, and only flood insurance can pay for the damage. Here is an example: say that a tree limb damages your roof during a rainstorm, and a large amount of rainwater then damages your ceiling and floor. That will be covered by your basic homeowner’s insurance. But, say heavy rain causes the creek in the area to rise and overflow your home; that will only be covered by flood insurance. Almost everybody lives in a flood zone; it is just how much risk of a flood there is in your specific area. The NFIP can tell you your home’s exact risk of flooding. Zones A and V are high risk areas, and moderate to low risk areas are B, C, and D. If you’re in zone D, the risk isn’t as clear because the area hasn’t been mapped out yet. But you can still purchase flood insurance and these zones are only used to help determine policy rates. Did you know, more than 20% of Flood Insurance Claims come from moderate to low zones? That means 1 out of 5, and that isn’t taking into account the homeowners who weren’t insured and couldn’t file claims. No one really knows just how many uninsured people there are, but only 18% of homeowners have flood insurance. Many homeowners don’t realize that you can’t count on government aid. It comes in the form of loans which you will have to eventually pay back. Before you can even qualify for a loan, your area has to be declared a federal disaster zone, and this type of assistance is declared in less than half of all flooding events. Also, did you know that the average flood claim is about $30,000? If you live where the water rises so high that emergency rescue crews would have to cut holes in your roof to rescue you, your potential flood loss could be a bit higher. If you decide that you do in fact want to purchase flood insurance, you should create a home inventory and then estimate the cost of repairing and rebuilding your property. Those two combined make up your total potential loss. FEMA has an online flood map locator that can estimate your premium and help you find an agent who sells federal flood insurance in your specific community. -What will and won’t be covered? -Will my policy insure me for actual cost or just what they’re valued at? This entry was posted in Uncategorized on December 9, 2014 by . When a storm hits your property, do you know how to distinguish what kind of property damage has occurred? When most home and property owners are thinking of roof shingles, they are usually thinking of asphalt shingles, which are the most common type of roofing shingles in the United States. These shingles are made from asphalt that is reinforced with organic material or fiberglass, and are then coated with small metallic granules that protect the shingles from UV rays, therefore speeding deterioration. These shingles come in a wide array of colors, sizes, and styles, and during severe thunderstorms, asphalt shingles can be seriously damaged and can require extensive repair or replacement. On an asphalt roof, hail damage will come off as a dark spot, or a bruise, where the roofing granules have been knocked away. In some cases there may be holes, missing shingles or cracking when it comes to hail or storm damage. If you have recently experienced a tornado, then you may notice split seams and torn or missing shingles. As a result of this, leaking can occur and even serious water damage; and this can lead to the formation of mold and wood rot, which can directly affect the building structure of your roof, resulting in a collapse. When a severe wind storm hits, it is also common for shingles or sections of the roof to be missing altogether. On other types of roofs, including wood, metal, tile and slate, damage can include broken or cracked shingles, missing shingles, torn or split seams, and missing sections of the roofing structure. If anything has fallen onto your roof during a storm, that could include a tree limb or other debris, there is a possibility that you may have sustained structural damage, and it is important to proceed with extreme caution. There are a couple common signs of roof damage, and they include: missing shingles, leaks in your roofing, dents on vents or gutters, cracked or broken tiles, slate, or concrete shingles, bruises or dented asphalt shingles, and granules collecting in gutters or downspouts. After a severe storm hits your area, the exterior of your home is the area that sustains the most damage. Wind, heavy rain, hail, and flying debris are the most common causes of exterior damage. If your property has been hit by hail, you could notice discolored spots, dents, cracks, or chips in your paint or siding. If you have a home made of stucco, you should look for cracking, chipping, and holes in the stucco! There are a couple signs of exterior damage such as dings and dents, holes and breaks, chipping and discoloration, and cracks and splitting. In areas that experience frequent high winds, many homes have protective storm shutters to protect any exposed glass. Even if you have these storm shutters, many windows can get cracked or damaged regardless. If your home has been hit by a tornado, high winds, or even hail, cracked or broken windows and damaged window casings are the most common signs of damage. It is always important to watch out for shards of glass, and to make sure you board up any shattered windows until they can be properly repaired. There are a couple of common signs of window damage, and that includes shattered windows, damaged frame, cracks and holes, and broken panes. If you suspect you have storm damage on your property, make sure to call a certified and qualified storm damage repair contractor. This entry was posted in Uncategorized on July 23, 2014 by . What is covered by Flood Insurance? Many home and business owners don’t know what is covered under flood insurance, and if it is really worth spending the money on. The truth is; flood insurance will save you a lot of time and money in the long run, especially if you live in a high-risk area that is prone to flooding on an annual basis. So what is generally covered by Flood Insurance? Direct physical damage to your building or to its contents by, or from a flood is covered by your flood insurance policy. An example would be a plumbing issue. If this issue was caused directly by the overwhelming amount of water from a flood, it would be covered. If your toilet overflows and there is no flooding present in your home due to a natural disaster, then it will not be covered. To learn more about Flood Insurance and how to go about implementing a policy for your property, check out what is covered for your specific plan here. Here is what IS insured under the building property coverage for flood insurance: the insured building and its foundation, electrical and plumbing systems, water heaters, central air conditioning equipment, furnaces, permanently installed carpeting and paneling (including wallboard, unfinished flooring, cabinets, and bookcases), machinery, canopies, walk-in freezers, outdoor antennas and other aerials attached to the structure, and fire extinguishing equipment and fire sprinkler systems. Purchasing Personal Property Coverage is also a smart idea, as many items can be destroyed during a flood in your home or business. Generally speaking, here is what is covered for personal property: machinery and equipment, furniture and fixtures such as chandeliers, other personal property owned by you and used at your business, merchandise held in storage, portable and window air conditioners, microwave ovens and dishwashers, carpeting or rugs not included in the building coverage, clothes washers and dryers food freezers (other than walk ins) and the food included in them, certain valuable items such as artwork and furs, and non licensed and self-propelled vehicles if stored inside the insured building and used to service the location. Many things are covered under the personal property and building property coverage, but here is what is not covered under either policy: Damage caused by mold or mildew that could have been avoided, damage caused by a sewer backup unless it was caused directly by the flood, currency, precious metals, and valuable papers such as recorded data, script, or stock certificates, property and belongings outside of the building or in another structure (trees, plants, septic systems, walkways, decks, patios, hot tubs, swimming pools) , financial losses caused by business interruption or loss of insured property, and most vehicles such as cars and their parts. Many homeowners believe that after the firefighters leave after putting out the fire, the danger is done and over with. This is not the truth; unless you have professionals help clean the smoke and soot damage, your property will never be returned to its former state. Although the techniques behind fire and smoke restoration aren’t extremely difficult, it still requires knowledge, experience, and manpower to complete the job in an effective manner. In turn, this means that a professional should always be called in this type of situation. Even though the fire has been put out, what is left behind will continue to damage the house if not taken care of. If ash and smoke are left untouched for an extended amount of time it will begin to corrode and discolor your surfaces, as well as leave a lingering pungent odor. Professionals in the field can stop this before it becomes a larger issue if they are contacted in a timely manner. There are many companies that advertise fire and smoke restoration, but only companies with proper training and certification should be hired. Any company that advertises IICRC technicians means that their technicians have undergone extensive coursework and uphold all industry standards to date. Professionals can clean smoke damage and restore items that were directly affected, but they must be taken to an offsite location to stop any further damage from being sustained due to ash. Ash begins to discolor surfaces quite quickly, it can happen within minutes. After a couple of days have passed, the ash will cause walls to be discolored permanently, as well as clothing and any upholstery. Also, wood and any vinyl materials will need to be replaced. If you do not call in a professional to clean the damage, the cost for services will catapult after a couple of weeks. Many items in the home may need to be replaced due to discoloration. Also, any lingering odors will only intensify, and it can become very distracting. Ash is acidic and if you wait to call the experts, the more damage will be sustained. When a team of professionals first arrives to your property, the first thing they will do is indentify all of the affected materials and the source of lingering odors. The only way to properly clean smoke and fire damage is to be thorough and meticulous. Ash residue can spread easily throughout the building, in turn causing nearly everything on the property to need restoration services. These experts will determine what and what cannot be salvaged, and will remove any built up ash from the surfaces. Once this is finished the company will locate the odor and treat it with detergents that are made specifically for neutralizing the odor that is present. Once the materials are finished being treated they will be sealed off to prevent any further damage from occurring in the future. 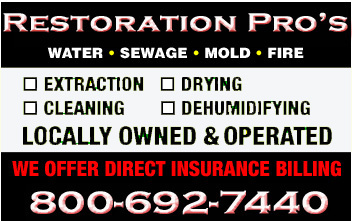 If you need any type of repairs from fire damage, make sure to contact the Restoration Pros for expert service from IICRC certified technicians! A persistent weather pattern is pushing extremely cold air south out of the Arctic to cause temperatures to plunge in the Midwest early this week, making this winter one of the coldest on record in some locations. Starting Monday and lasting for a couple of days, the actual outdoor temps will range from low double digits to below zero with wind chills making it feel -30 to -40. The National Weather Service reported Sunday night that the Midwest will feel very cold on Monday and even colder that the most northern city in the country which is Barrow, Alaska where the temperature will be -4. Over the weekend, people living in the greater Chicago area were preparing for a very cold Monday as the high will only be -4 or so. It could go as low as -17 in the city with wind chills making it feel like it’s -40. The bitter cold will hang over the Chicago area well into Tuesday. Due to the extreme cold, the University of Illinois at Chicago and Chicago Public Schools both have canceled classes for Monday. The arctic cold temperatures in the Midwest are causing all types of problems ranging from ice jams on rivers to falling icicles. A woman was injured in Pennsylvania Sunday when she was hit in the head by a piece of ice that fell from the roof of a building. The blowing and drifting snow has caused numerous roadways to close down across the Midwest which has prompted the closure of schools in many areas including the state of Michigan. The drifting snow is so deep in the Mid-Michigan area that it caused a massive snow plow to become stuck on a rural roadway this weekend. Many people are experiencing problems getting their vehicles to start due to the extreme cold. AAA of Michigan reminded people this weekend to check the condition of their batteries and to keep jumper cables in their vehicles in case they don’t start in this extreme weather. The insurance carrier is also reminding people to carry first aide kits, extra clothing, flashlights and sand or kitty litter. Many homeowners in the Midwest have experienced problems with frozen pipes inside their homes this winter. People living in homes older than 10 years are having the most problems with frozen water pipes which burst when thawing out. This is because newer homes which were built in the past ten years have been constructed with water pipes made from high density polyethylene which is resistant to freezing. This entry was posted in Uncategorized on January 27, 2014 by . Following closely behind on the heels of winter storms Cleon and Dion, another system containing wintery weather is bearing down on about one-third of the United States. Winter storm Electra is poised to begin developing in the Midwest Thursday evening into Friday and then track northeast over the weekend, dumping snow and ice. As Electra gains momentum from the moist air coming out of the Gulf Thursday, it will increase the amount of precipitation it drops over an area from eastern Kansas into northern portions of Missouri and Arkansas and western Illinois. People living in these areas should be aware of icy roadways and slick bridges. But, because the mixed precipitation could change over to rain during the nighttime hours, forecasters are not expecting significant accumulations of ice on roads, powerlines and trees. By Friday mid-day, Electra should be dumping snow over the Ohio Valley and Great Lakes. However, the heaviest snowfall should not occur until well after evening rush hour. The snow will continue to fall over these areas through Saturday morning as the system moves northeast. The northern portion of Pennsylvania may yield some pretty significant amounts of snow which could total close to a foot. The same thing could occur in portions of New England including Albany, NY, Scranton, PA and Concord, NH. Additionally, wind speeds will increase across New England late Saturday and early Sunday which could cause blizzard-like conditions. Up until now, New England has had it relatively easy as far as winter weather is concerned. While nearly 2/3 of the US is now covered by snow, people living in the Northeast have escaped with just a few minor winter storms. But, now that Electra is heading that way, snow amounts in New England could be significant. There is definitely potential for over six inches of snow and especially further inland where forecasters are not ruling out a foot or more. That could prove problematic on a weekend when many people will be heading out to do holiday shopping. People in New England are already being told to keep an eye on local forecasts and to plan their outings accordingly. This entry was posted in Uncategorized on December 13, 2013 by .